There’s a scene in nearly every Disney movie that documents the joy of dreams coming true. Cinderella when she is reunited with her glass slipper, Hercules when he finally goes the distance to prove his place with the other Greek Gods, Arielle when she has both her voice and feet, and the unforgettable moment when Pinocchio finally becomes a real boy. 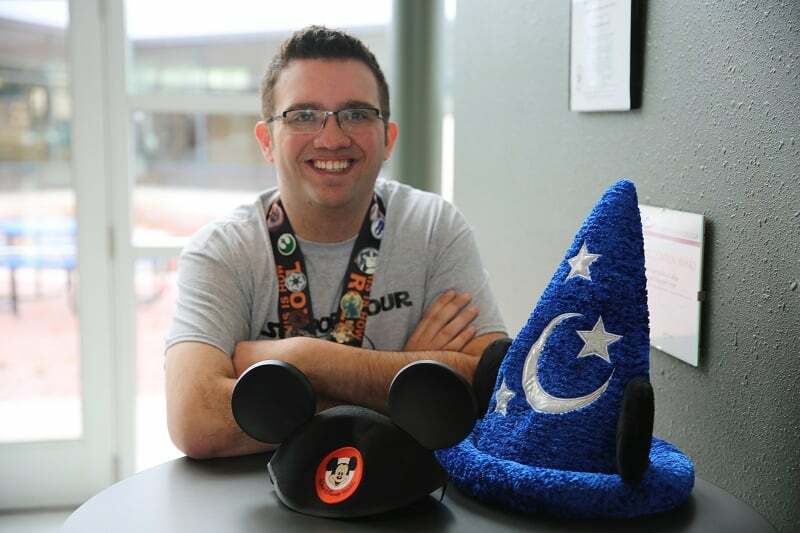 For Moraine Park student, Zach Stansbury of Fond du Lac, his Disney dream moment occurred late this summer when he was accepted into Disney’s College Internship Program . Zach graduated from Fond du Lac high school in 2011 and immediately went into the workforce. After a few years, he decided to pursue a career in law enforcement, and in 2017, he enrolled in the criminal justice program at Moraine Park. Zach is a part of the College’s Edge program, a Student Support Services program that provides academic advising, study groups, cultural services, and many other resources for qualifying students. He also noted that the Student Success Center, in particular, has helped him significantly with his test taking and school work. So where does Disney come into play? There’s no denying that Zach belongs at Disney, his energetic personality, contagious smile, and fun sense of humor are all staples to the brand that Walt created. He is also a lifelong fan of all things Disney. So, when the 2018 application window came open last January, he submitted his application and began the painful process of waiting. Well over 50,000 applications are submitted and only 18,000 are accepted into the program. “I never thought it was a realistic option for me until my friend Anna went through the internship and encouraged me to apply,” Zach said. Unfortunately, a few weeks later he found out his initial application was denied. He decided to study the application process some more and found how to improve his odds for the next time. One addition that Zach decided to include with his application was a video. He proceeded with a ‘go big or go home’ approach and chose Disney World in Florida as his filming location. His brother, Nicholas Stansbury, is a film director and traveled with him to help to create his video which he titled ‘Application Day‘. When Zach reapplied on August 20, 2018, he included his video. This time, it only took three weeks to receive his acceptance letter. Of course, during that time frame, he encountered personality tests, questionnaires, a phone interview, and even more waiting. Zach’s journey with Walt Disney World in Florida will begin on January 28, 2019, and we look forward to following his adventures. He is scheduled to return to Moraine Park next fall to continue his criminal justice degree. He will graduate May of 2020. We wish Zach the best of luck as he pursues his dreams at the happiest place on earth! Watch Zach’s application video here. As a fun side note, Zach also went to a casting call for Disney entertainers that was offered only to Disney College Program members. The Wisconsin auditions were held in Madison, and there were approximately 100 participants. It should come as no surprise that Zach was in the top four, and I have no doubts that he will be entertaining crowds at Disney someday. Stay tuned for more updates on Zach’s journey. Until then, you can learn about Moraine Park programs and services like criminal justice or EDGE at morainepark.edu.